Discover nature from the top of a mythic animal! You could have the great luck to meet some wild elephants in Khao Sok but it's not recommended... it is one of the most dangerous animals of the jungle! Better meet some domestic elephants! 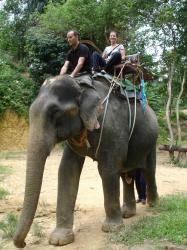 For sure, elephant trekking is a classical of Thai tourism. It is nevertheless a unique and fascinating experience. 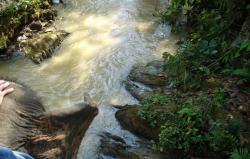 The Khao Sok area is an especially good place for such an experimence as the trails take you into the real jungle. 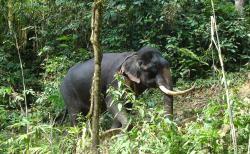 Two different elephant camps provide various tours so you can choose. The first camp provides a nice and easy trek in a wild and diversified landscape with a stop near a small waterfall where you can have a swim. The second camp provide a more sportive trek following a stream, adapted to the enthusiasts or, at least, healthy visitors. The ambiance is delightfully familial, including the welcome back with fruits and coffee. 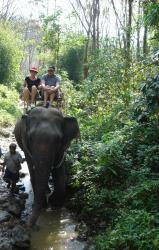 If you dream of riding the elephant the mahout way (on the neck), just ask... the experience is even more unforgettable!